Tesla has developed its own zero emission automotive technology and has brought it to market in less than ten years, beating the much larger, well established car makers at their own game. Can the UK develop innovative low carbon automotive technology and commercialise it? The 2014 Niche Vehicle Network (NVN) Symposium aimed to demonstrate that it is doing its bit to encourage ‘disruptive technologies’, and there were plenty of examples of small companies with potentially big ideas, such as Oaktec with its ‘self-supercharging’ engine concept. The Niche Vehicle Network (NVN) exists to support specialist automotive companies and projects rather than the mainstream manufacturers. Latest projects were showcased at the third Annual NVN Symposium, held at the Motor Heritage Centre, Gaydon, Warwickshire on 18 March 2014. 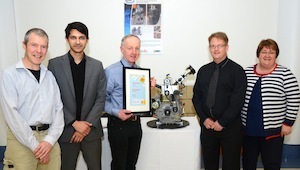 A new one-cylinder engine designed and engineered in the North West that has the ability to ‘self supercharge’ without any external forced induction, improving performance and reducing CO2 emissions in the process, has recently won the prestigious Shell Springboard Low Carbon Innovation Award with a £40,000 cash prize. The PULSAR engine concept is the work of Lancaster-based Low Carbon Vehicle innovations company and Northwest Automotive Alliance member Oaktec, which first prototyped the concept nearly fifteen years ago. However a recent Niche Vehicle Network-funded collaboration with Leyland-based NAA members mi Technology and former TVR and Mountune engine designer Simon Hindle has produced a new 400cc PULSAR 2 prototype that has shown huge promise in initial bench testing. The success of the recent developments suggests that PULSAR could have global commercialisation possibilities in a wide variety of applications and sectors. Potential in the automotive sector in its current form is likely to come from acting as a generator in a simple, low-cost, lightweight, range-extender electric vehicle. The reason the engine’s commercial potential application is so wide, according to Andrews, is because it uses solely conventional components and no exotic materials or sealing processes and would be extremely low cost to manufacture. The way it works is remaining confidential for now, but Andrews hints that the ‘self supercharging’ comes from getting gases within the engine to flow and react in a different way, mimicking forced induction, and allowing freer breathing for the engine through its novel combustion architecture. Even before the components within the engine have been optimised, bench tests have shown it to be 20 per cent more powerful, and more economical, than the Yanmar diesel generator engine on which the unit it is based. A further 10 per cent improvement is achievable, believes Andrews, through further optimisation of the parts. It currently runs on propane gas, but is very ‘fuel tolerant’, and can run on a wide range of fuels including petrol, diesel, bio-ethanol and bio-methane. Other potential applications Andrews sees for the engine include the ability to power generators to produce electricity for rural villages in developing economies using local bio-gas fuel through to power units for small aircraft. As the engine has particularly good characteristics when optimised to run on gaseous fuels, it could provide ultra-clean gas engines for taxis in polluted cities, and provide a cheap, efficient powertrain for small vehicles such as tuk-tuks. Andrews says there is still “lots to do” with regards to developing the engine, but the team is already looking at commercial opportunities for it, with the preferred option being to tie-up with a UK manufacturer to develop multiple versions of the powerplant. The consortium will now challenge five other low carbon innovations in the Shell Springboard National final in London on 6 May 2014. NVN projects such as the PULSAR engine concept are at an early stage and at a small scale. The challenge is how to take the idea, prove it works, and manufacture it at a large scale. Paul Andrews’ engine is a perfect example of a potentially huge global sales opportunity if the frequently-used term of the ‘Valley of Death’ is overcome. Technology Readiness Levels (TRLs) reflect the stages that technology progresses through. Projects such as the PULSAR engine concept are typically in the area of TRL 1-3, ie. early stage research. The Technology Strategy Board, which funds the Niche Vehicle Network, works in the area of TRLs 3-6 – ie. trying to bridge the valley of death that happens all too often between an initial idea and the successful commercialisation of that idea. It’s the job of industry to take products through the stages of TRLs 7-10. The Proving Factory, which is working with technology developers, can help take ideas forward to low, medium and high volume production, and the new Advanced Propulsion Centre will work at this end of the chain. So the UK has been doing a good job with the help of the Technology Strategy Board and the Niche Vehicle Network to help develop ideas, but it still needs the initial ideas to develop, and the NVN projects are excellent examples of technologies that can be commercialised with help from the TSB and other support organisations in the UK. As a new technology moves forward through the TRLs, the costs and the risks increase – but the value of the technology developer also increases. This is the opportunity for Niche Vehicle Network companies – and other companies that may not yet be part of the NVN. Of course there is currently a huge global demand for new technologies that help to lower vehicle emissions. Big OEMs can’t act quickly and take risks – and the example of Tesla coming from nowhere in just ten years to produce one of the world’s best all-electric sports saloons is an excellent example of this.